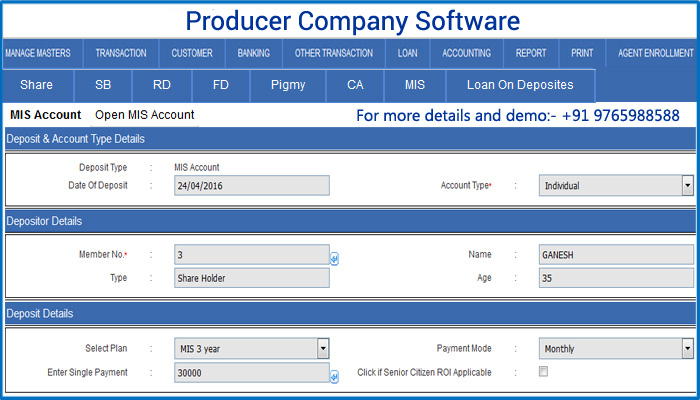 Websoftex is a online web based Producer Company Software Shrirampur built especially for Producer Company with automatic posting of business data to accounts module. Websoftex is a .NET based centralized database online software for Producer Company Software with core banking operations such Fixed Deposit, Recurring Deposits, Daily Deposit Schemes, Loan to Customers, Monthly Income Schemes, Dividend declarations etc. Websoftex handles the Members details. Websoftex handles all Saving A/c, Current A/c, FD A/c, RD A/c, DDS A/c. Websoftex handles management of Cheque book, Pass book and Bond. Websoftex handles all kind of Loan operations, Printing Loan Ledger, Automatic Interest Calculations.